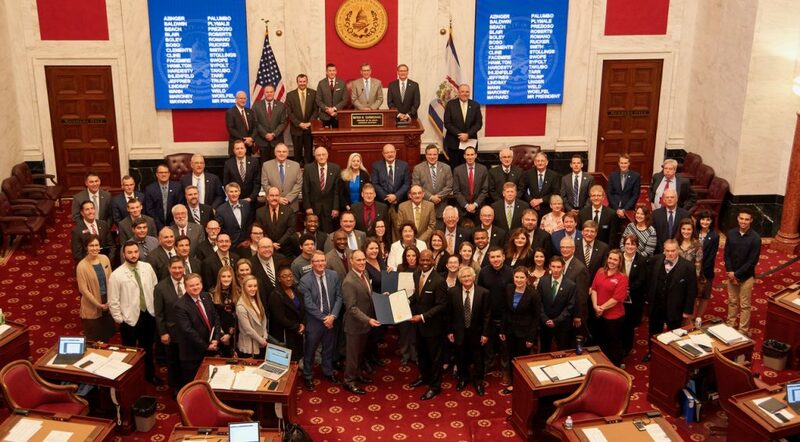 Presidents, students, alumni and staff members from West Virginia’s public two- and four-year colleges and universities and independent, not-for-profit institutions pose alongside legislators in the Senate and House chambers, respectively. CHARLESTON, W.Va. – Since 1969, more than 400,000 awards have helped West Virginia students pay their college tuition, thanks to the West Virginia Higher Education Grant Program (WVHEGP). College and university students, faculty and staff from across the state yesterday celebrated the 50th anniversary of this successful grant as part of the annual Higher Education Day at the Legislature. The WVHEGP is a need-based financial aid program designed to ensure West Virginia students with financial need are given an opportunity to pursue postsecondary education. The WVHEGP is renewable for up to four years of study for undergraduate students. As of the 2018-19 academic year, the WVHEGP awards up to $2,700 per year to qualifying students who attend qualifying public and independent institutions in West Virginia or Pennsylvania. In its first award cycle during the 1968-69 academic year, the WVHEGP was distributed in 173 awards totaling just over $24,000. Over the years, the number of grants issued to students has increased. It is expected that for the 2018-19 academic year, nearly 18,000 awards will be distributed to students, totaling almost $43 million. Yesterday, higher education leaders, students and alumni gathered at the West Virginia State Capitol to celebrate the anniversary of the WVHEGP during Higher Education Day at the Legislature. During the event, attendees celebrated the triumphs of colleges and universities in West Virginia. Higher education leaders focused on the changing workforce landscape of the state and how colleges and universities can work to provide students with the training necessary to grow and expand the workforce. According to the West Virginia’s Climb initiative, it is estimated that only 31 percent of West Virginians hold an associate degree or higher while 60 percent of West Virginians will need such a credential to meet future workforce demands. The West Virginia Higher Education Policy Commission (Commission) distributes grant awards for the WVHEGP. Brian Weingart, the Senior Director of Financial Aid at the Commission, explained how affordability often makes the decision for students regarding if they will attend college. Interim Commission Chancellor Carolyn Long discussed the historic and current impact of the WVHEGP. The West Virginia Higher Education Grant can be used in conjunction with other forms of state, federal and institutional financial aid. Awards are contingent upon annual funding of the program by the West Virginia State Legislature. For more information regarding the WVHEGP, visit cfwv.com/wvhegp.